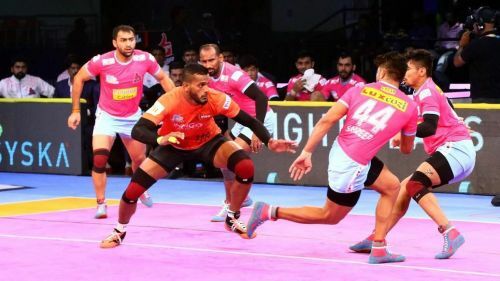 U Mumba produced a stunning comeback from down in the dumps to register a comprehensive 39-32 win over the Jaipur Pink Panthers at the Jawaharlal Nehru Indoor Stadium in Chennai. Against the Puneri Paltan, U Mumba's Siddharth Desai made a mark with a great show on his debut and facing off against a strong Jaipur defence setup, the youngster was up to the task yet again, finishing with 13 points to his credit while Rohit Baliyan's timely raids also fetched the experienced raider 7 points. While the match circled around the tagline of 'Anup Kumar v Jaipur', Anup himself did not have the best of starts with the Panthers against his old team while Nitin Rawal top-scored for the Panthers with 8 points. In a match that swung like a pendulum, Jaipur went into the break with a slender two-point lead which soon swelled to a four-point lead until Fazel Athrachali's men inflicted an all-out just in the nick of time to take the lead and with that, the match as well. The young all-rounder was undoubtedly the star of the game for the Panthers as he finished with 8 points, including one point from a terrific tackle that came at an important time for the Panthers. Anup looked a pale shadow of himself right throughout the game as he was kept quiet by his old team and although he enjoyed a battle with Fazel Athrachali, his four points from 10 raids highlighted his poor form. Playing his first season without Surender Nada on the left corner, Mohit Chhillar did not make much of an impact until the second half from which he picked three points, including a super tackle. The young left corner defender was in his elements in the first half as he kept the U Mumba raiders at bay to pick three points in a row until he slacked off in the end, giving away easy points in the end. The experienced defender, playing his first season with the Panthers did not have much to contribute on the defensive front as he made two unsuccessful tackles but played a key role in assisting tackles made by the two corners. Bought for a huge sum of money, Deepak Niwas Hooda was expected to fire on all cylinders but that certainly was not something that happened as on the day, Deepak was kept at bay by Surinder Singh and Fazel Athrachali, which saw him pick just 2 touch points from 11 raids. The Korean defender had nothing to show from the game as the one tackle he made in the early stages was unsuccessful and soon, he was taken off. Amit looked good on the raiding front as he came on and created a few issues for the U Mumba defence. However, on the defensive front, he lacked the discipline, often gifting away easy points. Ajinkya came in just for the one raid where he was thrown to the U Mumba defence on a pressure raid.